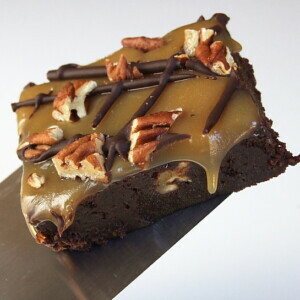 Fudgy brownies with plenty of caramel and pecans! Position a rack in the center of the oven and preheat the oven to 350°F. Spray the bottom and sides of a 9x13-inch baking pan with nonstick spray. Put the butter and chocolate in a medium saucepan over low heat and stir constantly until melted and smooth. Remove from heat and set aside. In a medium bowl, whisk the eggs until well blended. Gradually whisk in the sugar and then whisk vigorously until well blended. Whisk in the melted chocolate mixture, vanilla extract, and salt. Whisk in the flour and cocoa powder until blended. Stir in the pecans, and then scrape the batter into the prepared pan, smoothing it into an even layer with a spatula. Bake until a toothpick inserted in center of the brownies comes out with a few moist crumbs attached, 20 to 22 minutes. Transfer the pan to a wire rack and, if necessary, gently press down any puffed areas with a spatula to make the top level. Let cool about 5 minutes. Remove the pan from heat and carefully add the cream- the mixture will bubble up furiously. Once the bubbling has subsided, add the butter and gently whisk until completely melted. Whisk in the vanilla extract and salt. Pour the caramel topping over the brownies (it won't be thick). Roll the pan around (or use a spatula) to spread the caramel evenly over the entire top. Let the brownies cool on the rack for 45 minutes and then refrigerate until the caramel topping has set (at least an hour and longer, if possible). The caramel will most likely sink into the brownies quite a bit, leaving a thin layer on top of the brownies. Combine the chocolate and heavy cream in a small saucepan over low heat and stir constantly until melted and smooth. Pour chocolate into a small piping bag fitted with a 1/8-inch plain tip. (Or put in a small zip-top bag and seal the bag. Using scissors, snip off a corner of the bag to make a small hole.) Drizzle the chocolate over the brownies in a zigzag pattern. Sprinkle the chopped pecans over the top. Refrigerate until the chocolate is set, about 30 minutes. Cut the brownies into 36 rectangles. Serve chilled or at room temperature. (Well- covered brownies will keep at room temperature for up to 2 days and in the refrigerator for up to 5 days). If your kitchen is warm, it's best to keep them chilled. *If you prefer not to make homemade caramel, you can certainly use a store-bought caramel instead. Use enough caramel to cover the top of the brownies- about a cup or so should be fine. *These brownies are decadent and rich. A small piece is sufficient as a serving size. *They can also be a little messy with caramel dripping slightly off of the sides. We displayed each brownie on a small square of parchment paper and then placed it onto the platter. Then it was able to become a hand-held dessert without being so messy for the person holding it.